No-Solar Powered The Samsung NC215S was supposed to launch early this month on July the 3rd, according to Liliputing. However the netbook, which will hit your wallet for $399.95, is only available for pre-orders at this time. Details on the Samsung NC215S netbook first broke back in June when reports from abroad indicated that Samsung was about to launch the worlds first solar-powered netbook in Russia. The netbook was details as being your typical Intel Atom based 10.1-inch WSVGA netbook but it offered users the ability to charge their netbook on the go using solar panels built-in to the lid design for the netbook. 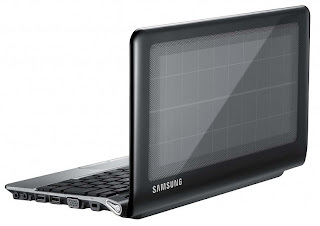 Well it looks like Samsung won’t be bringing their worlds first solar-powered netbook to the US until August. Official reports indicated the solar panels on the lid could offer the Samsung NC215S with one hour of battery life for every two hours in the sun, estimated battery life for the netbook was up to 14 hours. As I already mentioned above you can still pre-order the Samsung NC215S solar-powered netbook, if you want to do that Amazon.com will be willing to make a place for you on their pre-order list. Remember that this worlds first will cost you $399.95 when it start to ship in August.